Michael has a keen interest in the outdoors, the environment and how to lead an environmentally sustainable life. Before working with CAT, he had over 25 years' experience working as an Investment Manager for large life and pension funds. Michael, usually known as Mick, graduated from Exeter University in 1980 with a 2.1 in Economics and Politics. After a solo journey around India, he started work as an Investment Analyst in 1981 at the Guardian Royal Exchange Assurance Company, based in the Royal Exchange building in the City of London. Michael then spent 25 years in the City as an investment manager for large life and pension funds and, for the latter 12 years, was a Director and then Head of Equities for Threadneedle Asset Management. 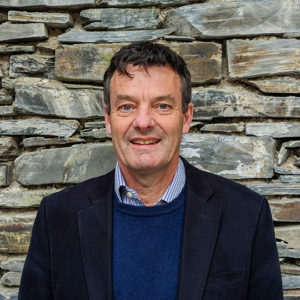 In 2006, he achieved a long-standing ambition of retiring from the City and beginning a second career, taking Trustee roles with the YHA and, in 2009, with the Centre for Alternative Technology as well as reviving and running Y Talbot, an Inn in Tregaron, Ceredigion. Michael has always had a keen interest in the outdoors and the environment and how to lead an environmentally sustainable life. His hobbies are cross-country running, walking and pretty much anything else outside. He lives near Tregaron.